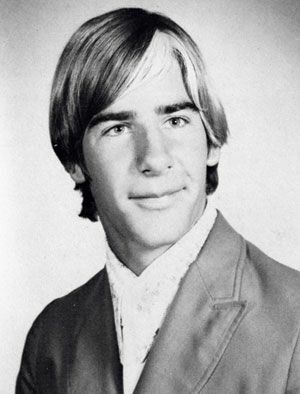 It was my plan to stay home and watch The Dark Knight for the nth time tonight but B insisted I go with him to a party on Lake Street so I shaved and put on a tie and a pair of slacks and within the first few minutes of our arrival a handsome older gay fellow said I look like a young Scott Bakula. The moral of this post, Future Corey, is when in doubt, go out. Also, you probably need a haircut. Thank you Laura, for capturing the sole butch moment of my entire life. I ran a half marathon this morning. I woke up with every intention of doing no more than three miles and then climbing back into bed, but I was in a good place with my thoughts and my tunes as I reached the end of the Panhandle and decided to keep going. I was somewhere around the Conservatory of Flowers when I realized Gay Running Club would be gathering for First Circle at about the time I'd arrive at Stowe Lake if I kept heading that way so that's what I did. Once there I stopped briefly to join the group for introductions and to welcome new and visiting runners and then ran the five-mile course to the ocean with Nick and Jamie. Instead of making a return to the boathouse afterwards, however, I continued on through the park toward the Divisadero Corridor where I looped back into the Panhandle, made my way through the Castro, past the tennis players in Dolores Park, to the edge of the Mission before turning around to wrap up the last half mile by doing laps up and down Waller. Later in the morning I was stretching and foam-rolling my legs while catching up with Kari on FaceTime when I said to her, half-jokingly, that after our encounter on Thursday evening I thought I'd see her running today. "I saw you," she said. "I was on my way home from the grocery store when a massive blur of hot pink went by and knew immediately who it was." I am at a The Wizard of Oz themed gay bar in Singapore right now.